backdrop that inspired the picture on the 20-Yuan note. Many river cruises provide the visitor the opportunity of visiting a quaint fishing village on the river, or you can go spelunking, hiking or (for the daring) rock climbing on the precarious peaks. For lodging, look in the city of Guilin for a higher-end hotel or stay downriver in Yangshuo, a smaller town extremely popular with Chinese tourists, or Xingping, the most quiet of the three. Guilin makes notoriously tasty rice noodles, so look for these at any restaurant. Guilin is very beautiful with thousands of hills, extraordinary shape, impressive view when on boat cruise through Li Jiang. It is must experience to visit Li Jiang. Went on a hot air balloon ride. Easily one of the most beautiful landscapes I have ever seen. 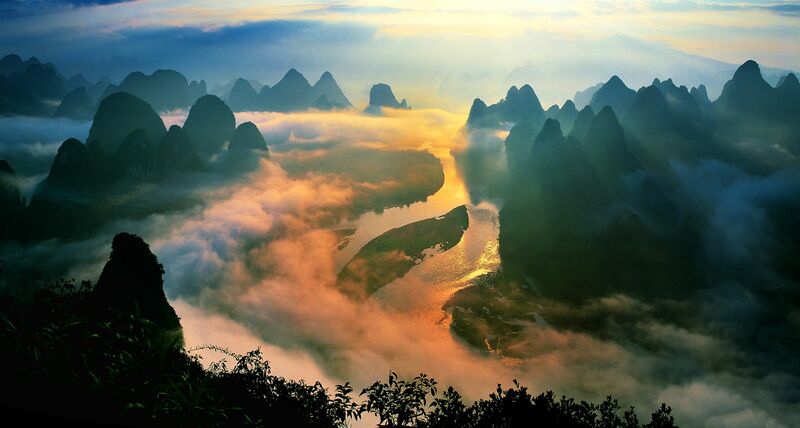 I suppose Guilin and it's misty karst peaks is the image that many have of China. Guilin is the place to catch boats up the Li River. Guilin was one of the first Chinese tourist cities that opened to the world and more than thirty years year, it is still thriving. Reasons are obvious, unique and beautiful sceneries, tourist friendly attractions, and delicious cuisine. Guilin remains a popular destination for both foreigners and locals today. i like travels everywhere in all over the world. I have just comeback after a long travel last for two weeks in Guilin, Guangxi, china. The travel is great. I discovered many interesting things in the place. Firstly, i really feel fantastic with landscapes in Guilin ,especially, the cruise along the Li River where you can view the unforgettable karst mountain landscape. I also have opportunity to ride a bicycle throughout the old villages in the morning. The atmosphere is so fresh. I am relax and comfortable here. People here are so friendly. Besides, services here is also the best. I stay at luxury hotels with beautiful view, fresh air, i can see the wonderfull scence of Guilin with long river and huge mountain in the morning. I feel like that i am living in fantasy world. It is only a little bit of my personal experience. Guilin is a mystical land. The favourite place is for people which like discovery. Nice view, share with you. We order the bamboo draft on taobao Internet. 145 RMB per person, very reasonable price. A few days later we started our tour. We were picked up and driven to a very swish hotel in Guilin. The kind of place where they carry your luggage,and look strangely at your backpack searching for the extendable handles and wheels. Not the kind of place I am used to staying on my travels. The first of many massive banquets and performances awaited us “The Visiting Amazing Guangxi Opening Ceremony”. As with many things in China we didn’t really know what was going on or why we were there. In fact, this is one of the reasons I love being in China so much. Your senses are filled, your social intellect challenged and the constant state of confusion means that you learn so much. James was asked to make a speech which must have been quite difficult as we didn't understand why we were there, we later found out that this was on broadcast on TV and after being introduced to many important and talented people we started to realise the caliber of the people we would be traveling with. The next day we took a cruise down the Li river from Guilin to Yangshuo 4 hours of beautiful scenery. Karsts and cliffs rising up from the wide shallow river, small villages with people going about their business and water buffalo lazing peacefully along the shore. We then headed back to Yangshuo to see a typical Chinese performance, lots of lights lots of performers and very impressive. Currently I’m being held captive at a beautiful hotel restaurant overlooking the Rd Bridge in Gualin. This is maybe the last large lunch I will eat……… courtesy of the Guangix tourism Bureau that is，but far from shedding a tear I have been stuffing my face with free food， as is the way with free things. This is a good place to break into the story. After Nine days on the road with six other foreigners and 30 Chinese. My press trip is at an end I’m exhausted and in a much better place to understand and relate to the people of the massive and diverse nation. Food is the glue that holds the people of this nation together. Morning lunch and dinner we have been served delicious food all in huge portions and variety, noodles for breakfast, and eggy toast in a five star hotel and carp and egg plant, chicken feet, (Stefan and I were invited to help kill a big which we then eat later in the day more of that at a later date at as it’s not really part of this trip) we are not forced to eat anything we didn’t want to and there was always some delicious alternative for the squeamish and the flexatarians among our party of seven foreignerss。 So please take note the food in this part of china is often hot and there are a lot of soups and hot pot which you can add plenty fresh vegetables to, and lots of different types of sweet potato including purple （my favorite）. On my recent trip to China, Guilin was by far my favorite destination. I used to think that the craggy mountains in traditional Chinese paintings were the stuff of fiction until I saw the breathtaking green peaks in real life. While there, I would recommend going to film director Zhang Yimou's "Impression Liu Sanjie" live show, which uses the Guilin mountains as a backdrop of the cultural play.